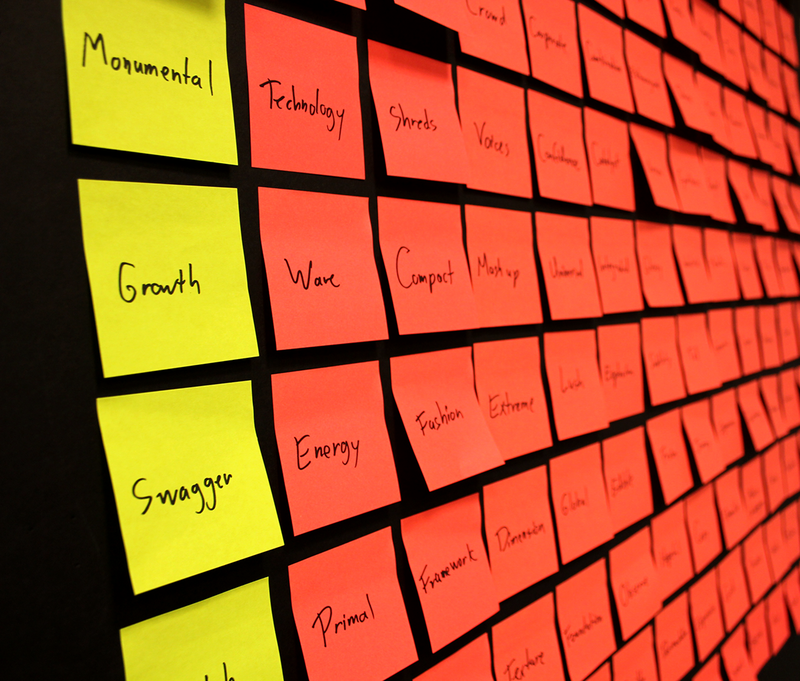 The NEXT 2015 identity is a stand-alone event brand with a 4–6 month lifespan. 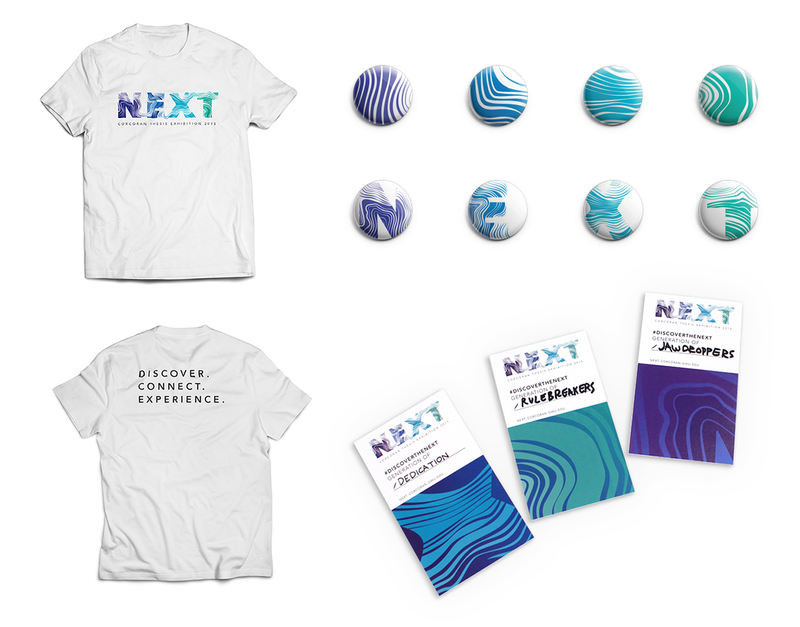 A stand-alone event brand has its own persona, while being connected to a larger institutional brand: in this case, the George Washington University’s brand. 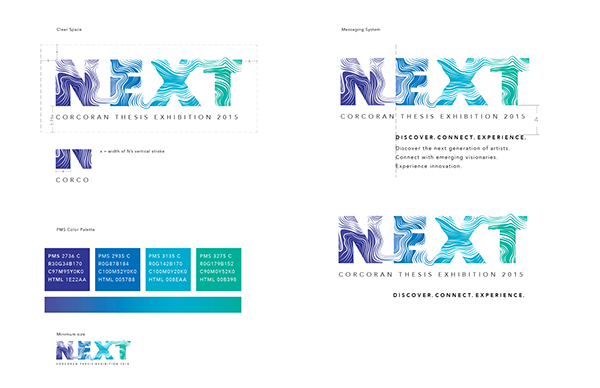 The NEXT 2015 Exhibition is a dynamic, interactive, and innovative presentation of work by the graduating students of the George Washington University’s Corcoran School of the Arts & Design. 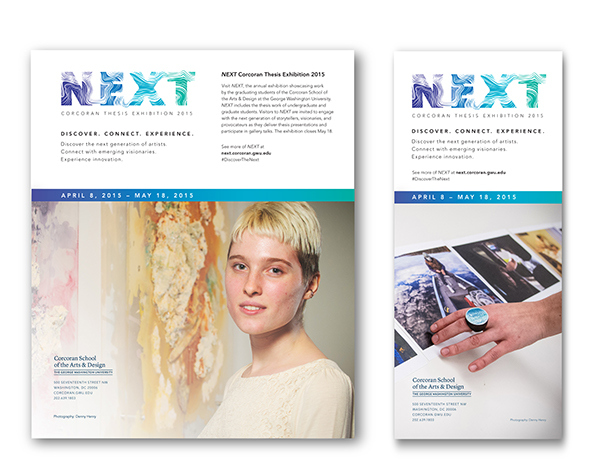 NEXT 2015 is a culminating thesis exhibition of Bachelor of Fine Arts and Masters of Arts degree candidates. 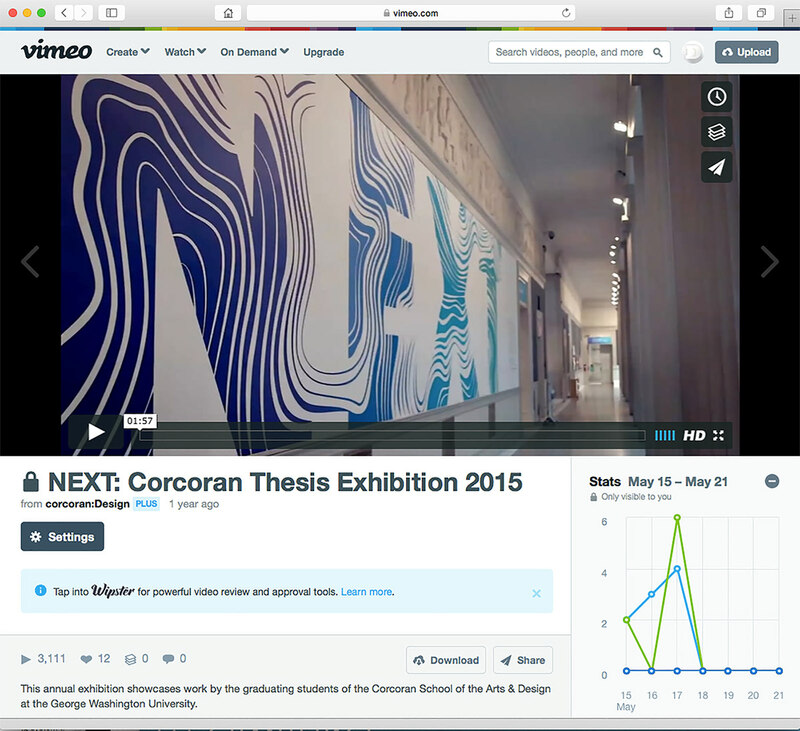 Visitors to the NEXT 2015 Exhibition have the unique opportunity to observe thesis critiques and discussions between students and faculty, and to gain insight into the visual form-making process. 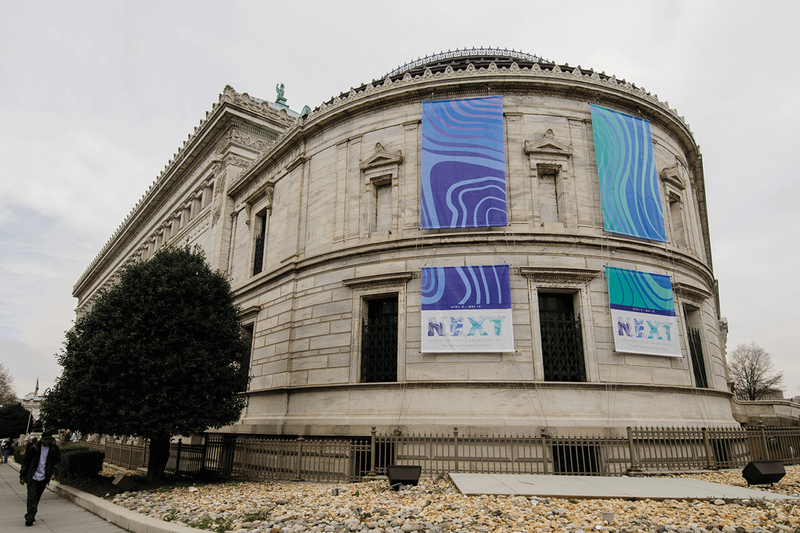 The Corcoran School of the Arts & Design continues its mission to educate and train students—the next generation of America’s artists and designers. 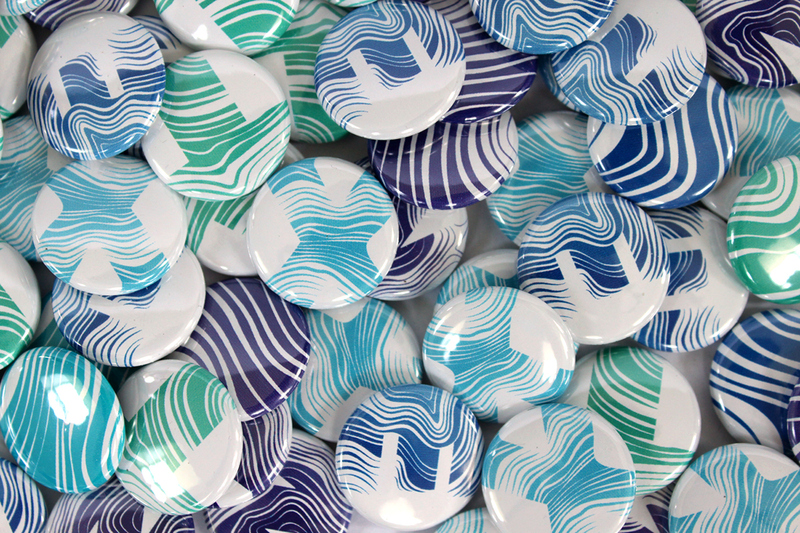 The NEXT 2015 Exhibition is an opportunity to connect GW with potential donors to generate donor interest and investment for the GW Corcoran School of the Arts & Design. 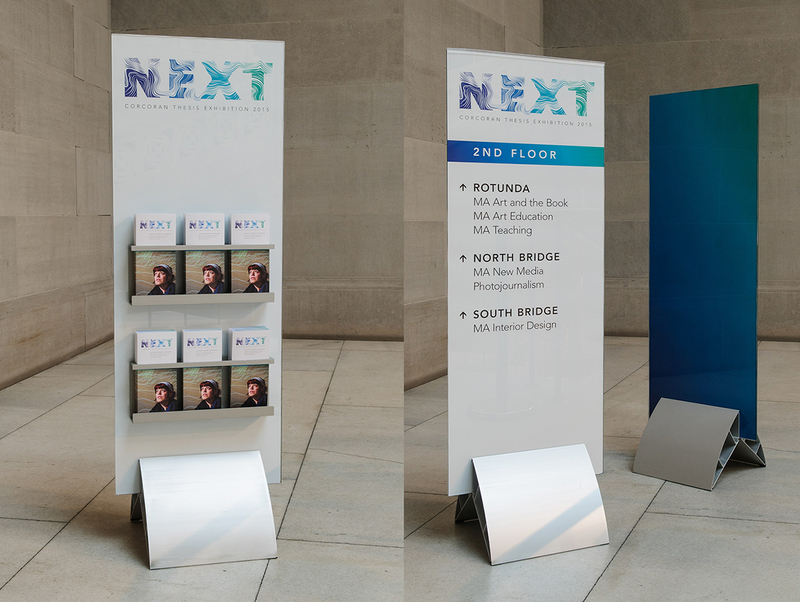 The branding program represents the Corcoran School’s institutional and program objectives, and appeals to a diverse range of audiences, including the DC arts community and GW’s expansive outreach network. Expressive discovery is inspired by the layered aesthetic of topography. Topography is the evidence of change over time, which parallels the Corcoran’s rich, creative heritage and exciting future. 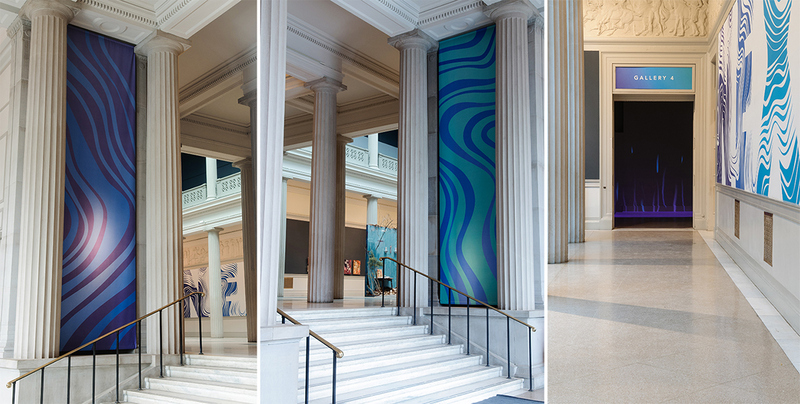 Merged components show the integration of two schools, while emphasizing the artistic diversity of the Corcoran’s programs and students. As students find their place within our community, they experience a journey that exposes them to multiple perspectives. This direction utilizes organic lines to symbolize a variety of individual paths that unite to form one community. This idea of individuality is further enhanced by the resemblance to a fingerprint. The NEXT 2015 identity program uses the typeface family Avenir Next and conforms to GW’s brand guidelines. 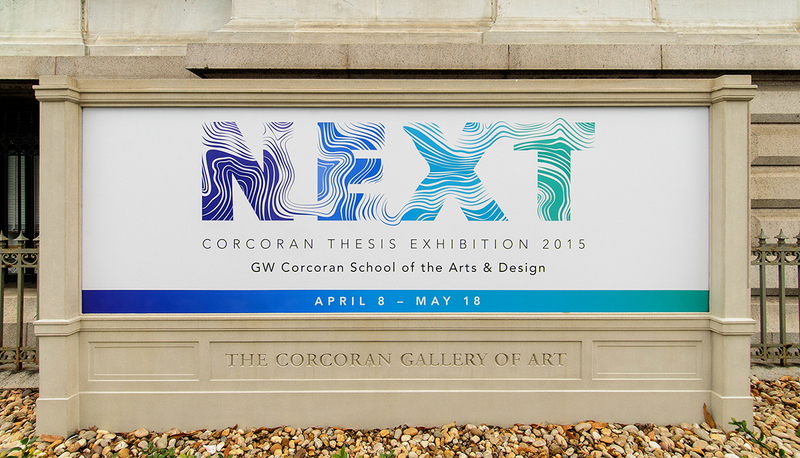 The NEXT 2015 Exhibition is a dynamic, interactive, and innovative presentation of work by the graduating students of the Corcoran School of the Arts & Design at the George Washington University. 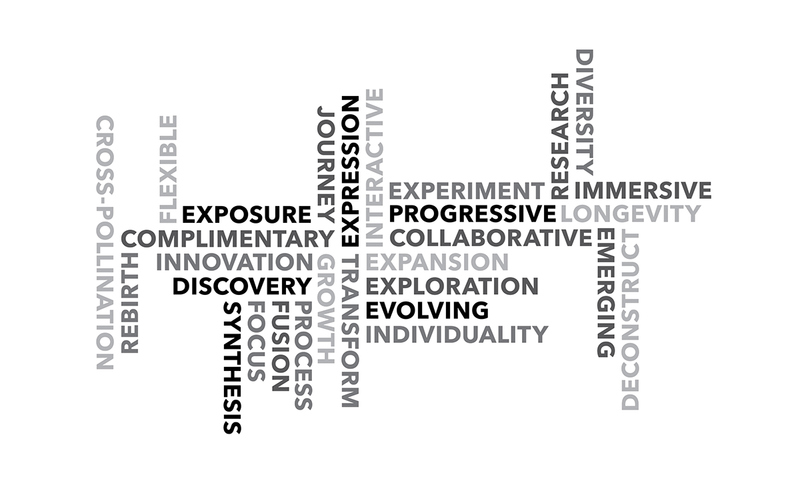 IDENTITY & WORDMARK: Expressive Discovery Expressive discovery is inspired by the layered aesthetic of topography. Topography is the evidence of change over time, which parallels the Corcoran’s rich, creative heritage and exciting future. Merged components show the integration of two schools, while emphasizing the artistic diversity of the Corcoran’s programs and students. As students find their place within our community, they experience a journey that exposes them to multiple perspectives. This direction utilizes organic lines to symbolize a variety of individual paths that unite to form one community. This idea of individuality is further enhanced by the resemblance to a fingerprint.